I think it was back in May or June; I was searching for new bread “stuff” on the internet like I often do. I probably drive my husband crazy with all the bread baking equipment I buy or ask for presents. He is at the point where he has no other option than to build me pieces of furniture for storage space. Unfortunately for him, it is unlikely that I will stop collecting anytime soon and most of the toys that come in don’t leave. Lucky for me he seems to like to build things. 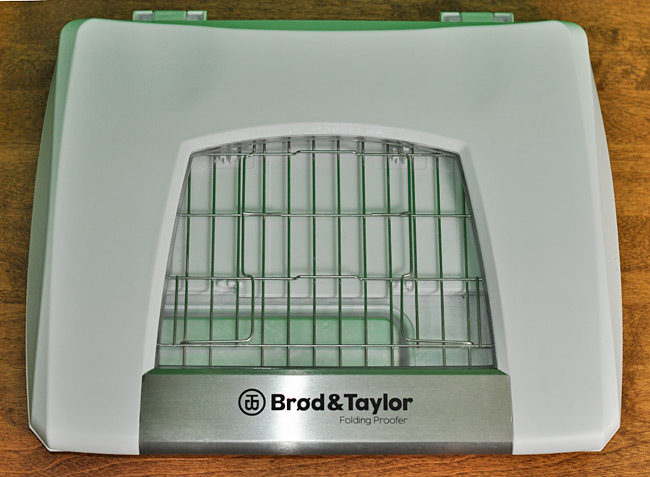 But back to the point, I came across Brod and Taylor’s site for the folding bread proofer, and it sounded intriguing to me. I am always being asked by students where the best spot is to allow your dough to ferment and proof. I typically let my dough ferment at a warm room temperatures, somewhere between 74 and 80 degrees Fahrenheit, so during the summer I really have no trouble at all getting my dough to rise. It is during our long and cold New England winters that this challenge of finding a warm spot comes into play. So, I read a little bit on the product and saw that it had a temperature range that went as low as 70 degrees and as high as 120, which to me is too high for fermentation, but the site said you could do other things in the higher temperature range, like melt chocolate or make yogurt. I was glad to see that it has potential to be a multi-purpose appliance. I don’t make a ton of yogurt, but I definitely think using the proofer would be a great tool to make it in. Soooo, how much is it and should I buy it? Well, I now know that it retails for $159 (which is less than I thought it would be) and but I couldn’t buy it because it was still in the development stages (it is now for sale). I figured I would contact them and find out more information. I couldn’t sign-up to be a product tester, because the deadline for that had already passed by the time I came across the site. The real kicker for me was that when I went to their contact page I found out they are based out of the exact same town as me! That was my clincher, I had to at least try and meet with the product developer, I mean we are practically neighbors. Well, long story short we met at the local coffee shop and had a nice chat about the product and bread in general, and he offered to let me try one of the proofers when the demo ones came in. Since we are basically neighbors he asked if I might be interested in helping him with some product demo videos. I thought it would be fun to be filmed in a kind of professional setting with some serious equipment and editing, instead of just my camera set up on a tripod in my sun-room. This was my first time getting to actually see the product and try it out, now mind you it was one of the hottest weeks during the summer, butter was literally melting on my counter. Luckily, his house was highly air conditioned, so we could get a feel for how the proofer would perform on cooler days. I really liked the fact that they took into account not only warmth, but humidity as well when designing the proofer. Dough really does like a slightly warm and moist environment to ferment in. Even though I did get to use the proofer during the shoot, I didn’t get a real feel for how it would do during an actual cold day. It was a kind of rushed environment and of course it was 90 degrees outside, so the dough didn’t need too much help. So, I was left to wait until a few weeks ago when my test proofer came in, which means now I am starting to put it through its paces and see how it really performs. This past weekend it was chilly and raining outside, absolutely perfect day for hanging inside with my son and baking bread. Michael, the proofer inventor, wanted me to develop a recipe or two for the product manual that would clearly explain how to use the proofer when making bread. I decided to start with something a little simple and went with country wheat sandwich bread. It isn’t a high ratio of whole wheat flour so it is still pretty easy to knead and I figured it was bread that you would want to rise at a nice consistently warm temperature. The first thing I did was plug in the proofer, set it to 85 degrees, and poured a small amount of water into the tray. I wish the spot where the electrical cord plugs in was located at the back of the machine, but it is located right by the control panel. I say this because I have a hard time positioning it on my counter so that it is set up facing me; instead I have to have it kind of kitty cornered so it can be both on the counter and reach an electrical outlet. I then made my wheat dough which, I kneaded by stand mixer. I have these great dough rising containers that have red marks on them at the 1 and 2 quart level, so I placed my dough in a lightly oiled dough rising container. That way I could see exactly when it had doubled in volume. I wanted to be able to give an accurate time in the recipe and since I can tell people what temperature to set their proofer on, there shouldn’t be too much difference in the rise time between batches. Of course there will be slight difference depending on how active your yeast is and your elevation, but as a whole it should be in a much tighter range than without that temperature control. I set a timer for one hour, but it wasn’t doubled by then. I gave it 30 more minutes and it was perfect. Usually in the dead of winter I am lucky to have dough rise in two hours, so I was happy with the result, and I guess if you want it done a bit faster you can up the temperature a bit. I really don’t like to rush my dough’s rise, because I think it hurts the flavor of the finished product, but it is nice when it rises in a timely fashion. I shaped the dough into a loaf and placed into a greased pan, then put it right back into the proofer for its final rise. It was nice not to have to worry about covering the dough with plastic wrap. I could just stick it into the proofer and let it rise. I am going to continue to use the proofer in the coming weeks and see how it changes my bread baking. I am really interested in using it to warm dough that I have placed in the refrigerator for an overnight fermentation. It can take a long time for a batch of refrigerator temp dough to come up to room temperature. So, I think it is going to be a really handy tool, since I refrigerate a lot of dough. I think that Brod and Taylor have come up with a really useful and innovative tool for the home bread baker, which helps to solve a problem that many of us are faced with when baking bread. I look forward to seeing how it continues to perform during the cold winter months. Brod & Taylor Folding Proofer in closed position. Brod & Taylor Folding Proofer in open position. Brod & Taylor Folding Proofer side controls.